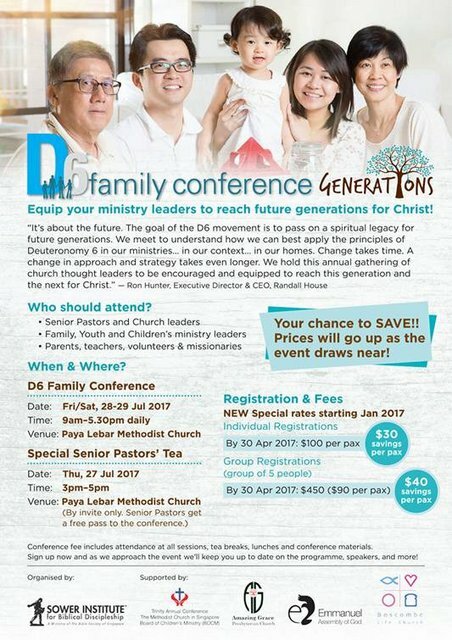 Description - The D6 Family Conference touches on the topic of Generational Discipleship. According to Deuteronomy 6 (D6), the family is to be the centre of spiritual formation. The event aims to help churches, ministry leaders and parents develop and sustain an integrated discipleship strategy that combines the relationship and influence of the church and the home. Organised by the Sower Institute for Biblical Discipleship and The Bible Society® of Singapore.